George Barber, played by Tom McCamus, has died a rather gruesome death and while police detective Berkley and his assistant Williams, played by Rick Miller, attempt to get to the bottom of this mystery, we see George relive his life with Joyce is a variety of new relationships. For example in one of the “possible worlds” they could have lived, George and Joyce have spent their entires lives in the same small, northern town and they’ve been married for most of their lives. In another, they meet as strangers and have a casual affair. 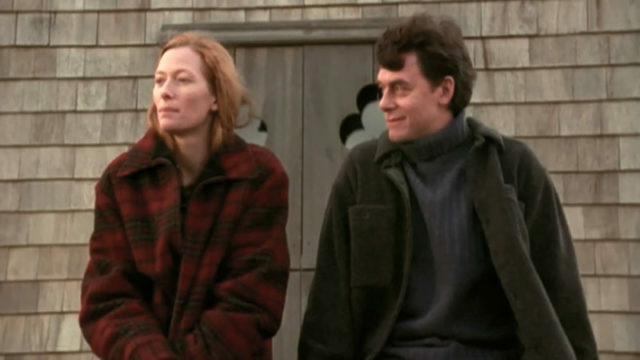 In yet another, Joyce has never before met or seen George. As George puts it, “Each of us exists in an infinite number of possible worlds.” Behind these realms of romantic possibilities is a world where science has gone insanely awry. Possible Worlds is a unique and fascinating blend of science, philosophy and tabloid sensationalism. 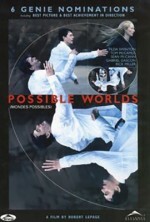 Possible Worlds is Robert Lepage’s first film in English.